tions; would it shed new light? That of a deeper understanding? This is an excellent piece on perspective. What something is changed depending on circumstance. Love the photo to go along with it. Thank you @snrm I am happy that you have enjoy what you have read here today. The photo I believe is what pulls this piece of work together. It to is also amazing how something is changed depending circumstance. You put into perspective the pressures of poverty and juxtapose it against our materialistic world, illuminating the absurdity that money is inconsequential, 'just' twenty dollars. Great job. Thank you @anjkara. I am glad you have enjoyed you read here today. With my words I hope to open the souls of many on so many different levels. This one. Really hit the heart of my soul and with all the amazing feedbacks. I am doing what I set out to do. Opening the souls of many! Even if they are snail steps. Not snail steps at all. You blew a hole right through my head. Love it. Thank you @mylittleblurbs I am glad you have enjoyed your read here today. This piece hits very close to home, I am sure that is why it turned out to be such an amazing piece of art. Yes all of my poems hit close to home but this one more so on a much deeper level. 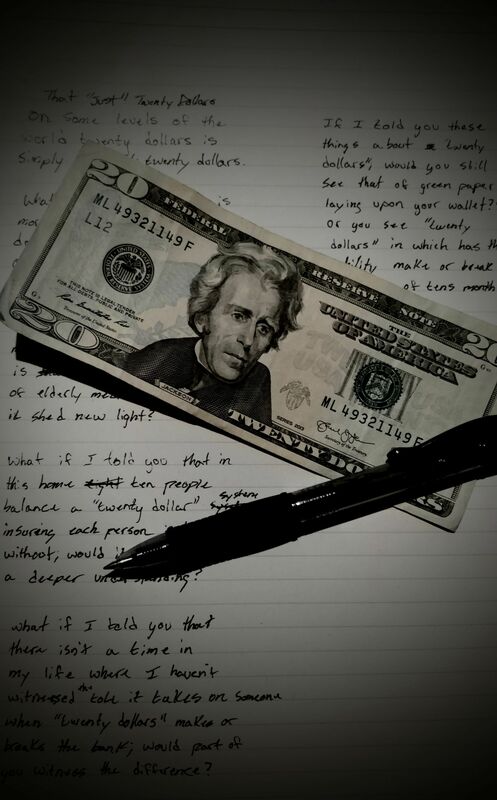 I wrote it in hopes to give sight on how a "Just" Twenty dollar bill has its affects on my small little world. This sorta explains my situation. I'm a doctor whose monthly salary is currently $65. So yeah, $20 isn't just twenty dollars in my world. It's the difference between being able to send your kid to school and your kid ending up at home for a year. This perfectly describes what a huge percentage of the world is going through. Awesome post. Thank you @stanleyc-md. I am glad you have enjoyed my post here today. You are correct as sad as it is to say many people all over the world witness the ability of that "just" Twenty Dollars. I for one live with my parents and I help my mother take care of my grandparents. Thus; the "just" Twenty Dollars. The world is changing and those of us in this situation have to hardship the positives out of the web of negatives. You as a doctor, I honor you for you gave your life to saving lives! There shouldnt be a price tag upon a human beings head but there is. In a way your sacrifice is one of the greatest one could give but it also come with a price of its own. Find the positive in the web of negative doc; for many people are live due to your hands of mastercraft. Replace the downfall with the ups that are create by the bound of family, friends, and love.